Four disparate groups of friends. Different places. Different times. Different lives. Yet, their destinies are inexplicably interwoven, and what happens to any one group will, in the end, affect them all. One Christmas Eve, Hiro Hirono helps Miyako, the victim of a purse snatching, and discovers that she goes to the same school he does. To the dismay of his childhood friend Kei, Hiro starts hanging out with Miyako. When Renji Asou meets Chihiro Shindou at an abandoned train station, he doesn't notice anything unusual at first, but he soon discovers that she suffers from a rare disease. Shuichi Kuze's been spending time with Mizuki Hayama. As they've been getting to know each other, they've been growing closer. Yuu Himura meets a girl who seems to know him, but he doesn't know her. Soon enough, however, he remembers a girl he met long ago, and begins to rediscover old, half-forgotten feelings. 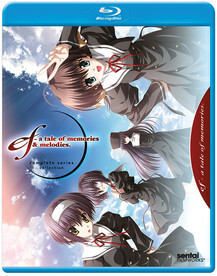 Contains episodes 1-12 of ef ~ A Tale of Memories and episodes 1-12 of ef ~ A Tale of Melodies.